Your independence and safety are our priorities. That’s why we make the stairlift-buying process as simple as we can. Wherever you are in Ireland or Northern Ireland, we want you to know that you can get your house back. If stairs have become a problem, there’s no need to move, and no need for single-storey living. To make your house safe and accessible again we need to provide a personalised service because everyone’s houses are different, and everyone’s needs are different. From your first contact with us, we are there for you because we know how to help you get the most out of your home. Your first contact with us will most likely be on the phone, where you meet one of our team of friendly consultants. They are there to answer all your questions and to listen to what you need. They might give you some advice over the phone, but chances are they’ll leave that to our specialist advisers. This is because the adviser will come to your house and talk to you in person. You don’t have to leave the comfort of your own home to get the information you need because they bring it all to you. The specialist adviser shows you what we can do for you and measures your stairs precisely, so that we can make a stairlift that fits into your home perfectly. When it comes to choosing a lift, you probably won’t know where to start. That’s what our advisers are there for: to ask you the right questions to find out what you need. They take the time to find out about your mobility difficulties, and how a stairlift could help you get your freedom of movement back. They suggest the perfect lift for you and even show you how we can customise it with different safety and comfort features and even a selection of fabrics and prints to suit your home. The adviser looks at where the chair will sit when it’s not in use, which side of the stairs would be best to install your stairlift on and which chair would suit your needs best. They tell you if you need a straight or curved rail and tell you all about our power swivel and footrest options. By the time they leave you, you’re sure you’ve covered all the options you could have. Once you have your stairlift, you get 2 years of warranty on the off-chance anything goes wrong. To give you peace of mind, the warranty includes a 24-hour breakdown service, so you know we’re there for you if you ever need us. We’re always here for you, so if you ever have a question, don’t hesitate to pick up the phone and give us a call. One of our friendly consultants is more than happy to help you out. Stannah's trusted dealer in Ireland and Northern Ireland, will call you within 24 hours. Without meeting you and seeing your stairs, we can’t even estimate a quote for you. No. Stairlift installations are quick, clean and easy. We even clean up any dust from the installation. How does the Stannah Ireland warranty work? 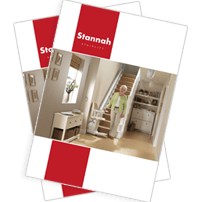 Stannah follows all EU and UK regulations, giving you a 2-year warranty on your new stairlift. We make stairlifts that are made to measure. They’re made to fit both you and your stairs, so we can only give you a price once we’ve seen both.